Through six weeks, Bryce Harper has emerged as the No. 1 overall player in fantasy leagues. In this week’s Pitching Report, we looked at the top-20 fantasy starting pitchers through the season’s first six weeks, illustrating the unpredictability of the position. In keeping with the thematic pairing that we’ve done a few times this season, let’s take a look at the game’s top-20 hitters thus far. As you might expect, there aren’t nearly as many surprises in this list. While only seven of the top-20 hitters to this point of the season—Paul Goldschmidt, Anthony Rizzo, Jose Altuve, Miguel Cabrera, Mike Trout, Josh Donaldson and Giancarlo Stanton—were also in the top 20 by average draft position, many who joined their ranks were not far outside the group during draft season. Eight more of the current top 20—Bryce Harper, Nelson Cruz, Adrian Gonzalez, Justin Upton, Dee Gordon, Todd Frazier, Starling Marte and Jacoby Ellsbury, were among the first 45 hitters selected in a typical draft. That means just five hitters really came from out of nowhere to join the top-20 hitters during the season’s first six weeks. The surprising five? Eric Hosmer, Matt Carpenter, Stephen Vogt, Kendrys Morales and Jason Kipnis. Hosmer, Carpenter and Morales were all coming off the board in the middle rounds, but have performed at a second-round level to this point of the season. From a pure return-on-investment standpoint, Vogt and Morales have been two of the most valuable fantasy players in the entire league. Just as we observed in the Pitching Report, however, this season has given us further proof that hitting is the far more predictable fantasy asset. Of the players who were in the top 20 by ADP but are not part of that group now, Michael Brantley and Adam Jones are just barely on the outside, while Edwin Encarnacion and Andrew McCutchen have picked it up in recent weeks. Carlos Gomez has dealt with injuries for a large portion of the season, and you’re probably not going to find too many Jose Abreu or Jose Bautista owners looking to sell their sluggers. Even in another golden age for pitchers, hitters are the more bankable fantasy commodity. That’s two straight weeks for Harper as not just one of the top-three hitters in standard 5x5 leagues, but as the very best. You could argue, however, that he was lagging a bit last week compared with what he did in the prior seven days. Harper left the yard just three times last week, after doing so on six occasions the week before. Harper was especially dominant in the Nationals’ sweep of the Padres over the weekend. He went 8-for-11 with a pair of homers and six RBI in the three wins, spurring both the Nationals and his fantasy owners’ squads. The 22-year-old is enjoying a breakout campaign, slashing .338/.476/.729 with 14 homers, 37 RBI, 36 runs and two steals in 170 plate appearances. He leads the majors in runs, RBI and OBP, while ranking second in homers and 11th in batting average. Knowing that, it shouldn’t come as a surprise that he is the No. 1 overall player in fantasy leagues through the season’s first six weeks. It was a relatively quiet start to the week for Cabrera, who went just 1-for-6 in the first two games of Detroit’s three-game set with Minnesota at the outset of the week. He hit two homers and drove in a five runs in the series finale, and that sent him into the weekend series with St. Louis swinging a hot bat. He added five more hits, including two more homers, and four RBI, as the Tigers took two of three from the first-place Cardinals. After a 2014 season that could only be considered a disappointment if your name is Miguel Cabrera, he’s producing among the fantasy elite again this year. Through 165 plate appearances, Cabrera is hitting .333/.436/.601 with 10 homers, 30 RBI and 23 runs. After just his fifth full week in the majors, Bryant earned a spot atop the Hitting Report. It took him a while to get that first homer, but they started coming in bunches once he finally got one over the fence. After hitting his first homer on May 9 against the Brewers, he hit three more in his next six games. The way pitchers have gone after Bryant, as well as his approach and understanding of how they’re pitching him, has been most remarkable in his first month in the majors. He already has 24 walks, which has him tied for seventh with Paul Goldschmidt, even though he has just 129 plate appearances. Among those in the top 10 in walks, Jose Bautista has the next fewest plate appearances with 139, and everyone else has at least 148. Bryant’s 18.6% walk rate is fourth in the majors. 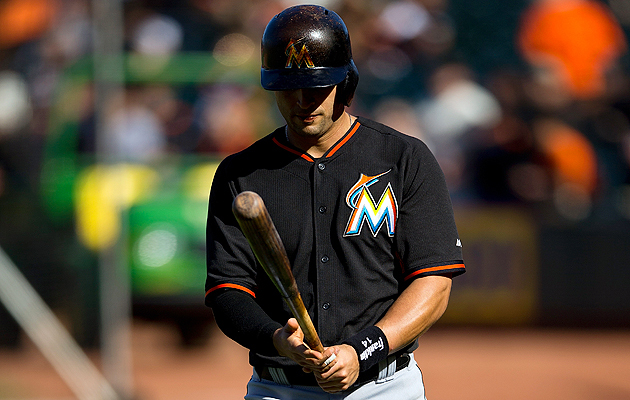 Prado had a nightmare week that dropped his season slash line to .270/.310/.351 from .295/.336/.393. He actually had one hit in each of the Marlins’ three games with the Dodgers, though he didn’t really factor into any of the scoring. He then went just 1-for-14 over the weekend as the Marlins got swept by the Braves. All four of Prado’s hits were singles, and he struck out five times. Prado’s entire fantasy value is built on positional flexibility and a high batting average, but he failed in the latter last week. Martinez started the week with a thud, going 0-for-4 in back-to-back games against the Twins. He got the day off in the series finale, and then the entire weekend off with the Tigers playing in a National League park. He did get one pinch-hitting appearance against the Cardinals, fouling out to third with the tying run just 90 feet away from home plate in the seventh inning. The Tigers are once again having a strong year, but this time it’s no thanks to Martinez. He’s hitting a paltry .224/.317/.280 with one home run in 126 plate appearances. It was easy to predict that the 32 homers he hit last season would be an anomaly, but his total power outage this year has been shocking. It’s awfully hard to outright drop a player with his track record, but he has been one of the worst fantasy hitters all season. Betts actually got off to a nice start last week, going 2-for-5 with a pair of RBI and a walk in a win over the Athletics last Monday. He went just 1-for-20 the rest of the week, and earned himself a day off in Boston’s win over the Mariners on Saturday. Betts was a chic breakout pick this season, but he has suffered through the sort of vacillating performance that plagues many young players. Betts is hitting .221/.287/.389 with five homers and five steals in 168 plate appearances. There’s no doubting his long-term potential, but he just isn’t squaring up many balls in his first full year in the majors. That such growing pains can be expected for young players doesn’t make them any easier for Betts’ fantasy owners to stomach. Fowler is unlike most of the buy recommendations we’ve had in this section in every edition of the Hitting Report in a couple ways. First, he’s not a star player falling short of expectations. Second, he’s actually on the free agent list in a lot of leagues, so buying him would only cost you the worst player on your roster. Given that exceedingly low price tag, it’s hard to believe he isn’t on more fantasy teams already. Fowler has brought his on-base skills to the top of the Cubs’ lineup, posting a .354 OBP through his first 162 plate appearances. 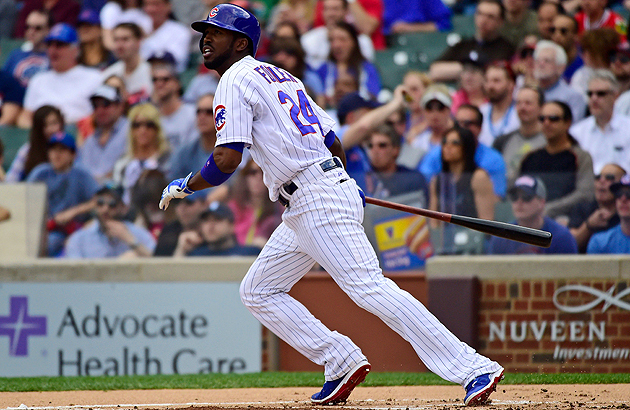 Thanks to a potent order that includes Anthony Rizzo, Kris Bryant, Jorge Soler and Starlin Castro, as well as Joe Maddon’s aggressive style as a manager, Fowler has turned a major profit for his owners in both the runs and steals categories. Fowler’s 26 runs have him tied for 14th in the majors, and his nine steals are good for a tie for 10th place with Houston’s Jake Marisnick. Assuming he stays healthy, he should score 90-plus runs and steal 20 or more bases. Only seven players matched those numbers last year, and all were universally owned in fantasy leagues. It’s time for Fowler to start trending in that direction. This recommendation comes with one major caveat: It’s entirely possible that you’re only competitive in steals because you own Hamilton. If that’s the case, you’re probably better off holding onto him and dealing with the headache he causes by getting on base at such a pathetic rate. If you can sacrifice his speed, or get a decent amount in return for him, however, he’s one of the best players to sell at this point of the season. We were down on Hamilton entering the year for the exact reasons that have played out on the field. For all the value he brings fantasy owners with his steals, he doesn’t do anything else, and is an albatross in whatever rate category your league uses. Hamilton may lead the majors in steals, but he’s still just the No. 80 overall player in 5x5 leagues. That’s hard to accomplish when you lead the league in one of those 10 categories. If you’re not dependent on him to compete in steals, he’s more trouble than he’s worth. That won’t be true for everyone in your league, however, and the shininess of all those steals will help you reap a nice return for him in the trade market. Through the first month of the season, it appeared Kipnis was again going to suffer though a disappointing season. He hit just .218/.263/.287 in April, with a strikeout rate that was nearly triple his walk rate. Everything has changed for Kipnis in May, however. The 28-year-old second baseman is slashing a ridiculous .508/.587/.810 with three homers, eight doubles, 18 runs, nine RBI and three steals. He has drawn nine walks while striking out six times. His entire approach at the plate has changed, and with it has come the results that we’ve expected to see with consistency since his breakout first half back in 2012. The hot streak might lead some owners to believe Kipnis is a sell-high player, but that is not the case. Rather, they should be happy to have one of the best fantasy second basemen on their roster for the rest of the year. Expect the high times to continue for Kipnis atop the Cleveland lineup. Kipnis is back among the elite at second base, and he should have a new double play partner at some point in the not-too-distant future. Lindor has been the gem of the Cleveland farm system since the organization selected him with the eighth overall pick in the 2011 amateur draft when he was just 17 years old. Now 21, he was universally a top-10 prospect according to the major ratings services heading into this season, with both Baseball Prospectus and MLB.com ranking him fourth overall. With Jose Ramirez hitting .168/.220/.228 through 29 games, it’s only a matter of time before the Indians make a change. Lindor will be the guy who takes over. Whether or not he makes a fantasy impact is a different story. While Lindor is undoubtedly one of the best prospects in baseball, that owes largely to his elite defense at the most important position on the field. By all accounts, Lindor will be one of the best defensive shortstops in the majors the moment he steps onto a big league field. That’s great news for the Indians, but it doesn’t do a whole lot for his fantasy prospects. Lindor has no power, and scouts grade his hit tool at only slightly above average. He’s slashing .280/.354/.399 with 12 extra-base hits and seven steals at Triple-A Columbus this year, and he hit just .276/.338/.389 between Columbus and Double-A Akron in 2014. Lindor will likely make the Indians a better team, but he’s not on the same fantasy level as Addison Russell, Carlos Correa or Corey Seager, his fellow top-prospect shortstops. The other three are all expected to be middle-of-the-order hitters when they’re in their primes. Lindor, meanwhile, will have to be an on-base and speed player to make an impact on offense. He may be of fantasy relevance in the future, and those of you in keeper or dynasty leagues should be monitoring his progress in the minors, but owners in redraft leagues can likely do better at shortstop this season. Addison Russell has received plenty of attention from the fantasy community because of his bat, but his glove is just as good. He’ll be a shortstop in the majors before long, but the ease with which he has taken to second base has been remarkable. If you don’t believe that, ask the Pirates and Neil Walker, who watched him make this gem of a catch.